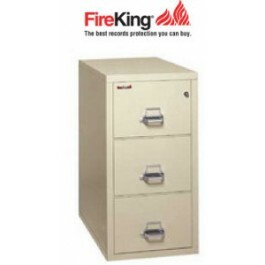 When (3) three drawers is the right size for you, you cannot do better than the FireKing 2 hour UL fire rating on the 3-1943-2. Like all FireKing vertical filing cabinets, it's UL Rated for a fall from 3 stories! This fireproof file is designed to hold letter size hanging file folders. 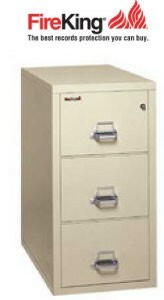 This UL 2 hour rated fire filing cabinet has all the best features you rely on FireKing to provide, from UL fire and impact rating to ETL media protection for up to 1/2 hour, this 3 drawer vertical cabinet will protect documents and paper records to the fullest.